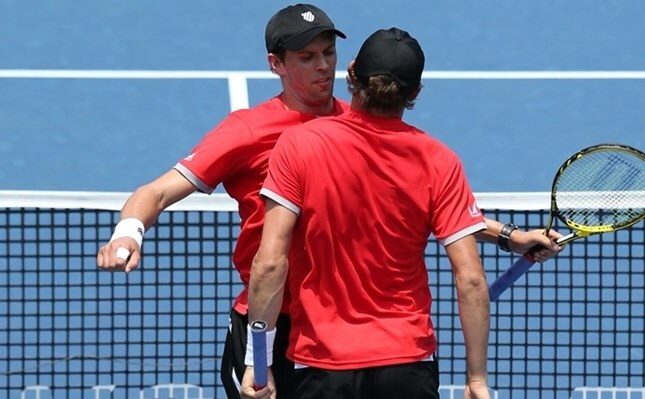 Bob and Mike Bryan may be the regarded as the greatest doubles team of all-time, but there is one title missing from their résumé- the BB&T Atlanta Open. The Bryans have summed a record 106 career titles and have finished No. 1 in the ATP World Rankings, 10 of the last 12 years. On Saturday, they took a giant step towards claiming their first title in Atlanta by beating the Atlanta-based team of Christopher Eubanks and Donald Young 6-2 6-4. The 19-year Eubanks had quite a week at Atlantic Station in reaching this ATP World Tour 250 semifinal. The rising sophomore was granted a wildcard into the main draw of both singles and doubles. The No. 1 doubles team in the world is looking for their fourth title in 2015. The victors didn’t face a break point in the match and converted on three of six chances to pull away in each set. The California natives pounded out five aces and a dozen more service winners against the Atlantans. Mike Bryan said he was satisfied with their performance.